Many scholars have discussed the influences of Islamic art and architecture on Venetian building. How and why were Venetian architects influenced by that heritage? A deep dive into medieval geo-p[olitics can help answer these questions. Almost everyone knows Venice, the city built on the water. Even those who have never visited Venice or live on opposite sides of the world can conjure up a one-of-a-kind city with unique art and architecture. The architecture of Venice is cosmopolitan, merging the most diverse inputs: the purest Gothic influence from the north, Romanesque typical of medieval Italy, the Byzantine, and of the most interest to us here, the Islamic. Since the mid-nineteenth century there have been relatively few detailed attempts to discuss the influence of Islamic architecture on Venice apart from a few hypothetical studies and speeches. For a geopolitical powerhouse like Venice, the main trade center linking the Adriatic and the Mediterranean seas to Constantinople and even to Mamluk, Egypt and Syria in the 14th century, Islamic influence is a given. Some architectural elements in Venice remind oneself of mosques and caravanserais. Take the pointed arches of the St. Mark’s Basilica façade, the crenellations of the most famous civilian palaces such as Doge’s Palace, Ca’ d’Oro and the fondacoes, translated directly from the Arab funduq, which were residences welcoming traveling merchants. To what extent can we describe such Islamic influence? Is it possible to describe in more detail the influence of Islamic architecture on Venice, a city that during the Middle Ages and Renaissance bridged the East and West? Isolated forms of original Islamic architecture appeared in Venice and later merged with Venetian architecture. This created a unique and typical style, commonly known as Venetian Gothic that Otto Demus defined as having Saracen taste integrated with Gothic themes. Prior to John Ruskin and his analysis of the architectural element of the arch, it was assumed that Gothic pointed arches coming from the North and those from the Islamic world were practically identical and nearly impossible to distinguish. However, such discourse on Islamic influence cannot be limited to a single architectural element since a broader historical and geographical context can be explored for more thorough understanding of cause and effect over this period in history. Over decades, the geography and chronology of Islamic influence touching Venice has been narrowed especially to Fatimid ‘Saracen’ Egypt. Deborah Howard’s work was of paramount importance for reconstructing the relational network between Venice and Islamic territories, including the relevant geopolitics involved. Venice has always been a mercantile city, as trading center for goods and merchandise from the East through the maritime routes of the Adriatic and the eastern Mediterranean. Since the 19th century, hypotheses have been made about the possibility of Venetian merchants importing and imitating foreign and Islamic architectural elements at home, a likely occurrence since the 13th century. With the conquest of Constantinople in 1204 the introduction of oriental elements in Venice were looked upon favourably. This brought in changes to Venetian art and architecture, accentuated by a new awareness of building styles found in the far reaches of Venice’s trade routes going as far as Egypt and Syria. Venice needed and wanted to legitimize its supremacy in the Mediterranean, and therefore imported eastern marbles, columns and capitals of reuse, including Alexandrian elements in the Marcian area, which would also serve the purpose of creating an authentic background for the relics of the new patron Saint Mark, smuggled from Alexandria in the 9th century at the very beginning of trade with the Egyptian city. Gur-i Amir Mausoleum, Samarkand, 1399-1405. Trade continued even following the Crusades and the partial occupation of Constantinople: the Byzantine capital became the Venetian base for trade with the East, particularly with Mamluk, Egypt. In the first phase, between the 10th and 12th centuries, Constantinople would have transferred the same architectural influence to both Venice and to the Islamic world, so Venetian architecture would have shared similar patterns as in Egypt. After 1180, this style became more slender introducing Egyptian and Persian features that evolved into what is known as typical arabesque style. The Venetians adopted Arabic elements mostly in its civilian architecture. Typical elements of mosques appeared, like the parapet crenellations, already described by John Ruskin as ornamentation and as an adaptation to light. The continuous journeys to the East and back had created efficient channels of communication that made Venice open to Eastern values and culture. Stories told by returning travelers from the colonies would have created common knowledge tied to the East that may have even been linked to architectural elements that were also imported from the East. Deborah Howard pays particular attention to how Islamic elements may have been transmitted and spread in Venice. the presence of an artist within the traveling group, who had to remember that idea and reproduce it back home; and finally, the presence in the homeland of informed spectators who could grasp and accept the symbolic and historical values of the elements imported from abroad. Such elements would be filtered through oral narratives, travelers’ writings, and from human memory that modifies and transforms what passes through our pre-established cognitive plot to create a set of pieces that overlap in an architectural transmission channel. In addition, it is reasonable to assume that the Venetians were able to seize such references in a special way, since that society, dominated by merchants, was led by a large number of individuals as protagonists of trade beyond the Adriatic, selling their eastern goods almost exclusively in the Rialto market. The heart of the city thus became a hub of influence and Middle Eastern flavors, contributing to the creation of a link between commercial reality and architecture. Doge’s Palace, prominent symbol of Venetian civil architecture and one of the most famous buildings in Venice along with St. Mark’s Basilica and the bell tower, includes numerous elements that presuppose at least one deep look at Islam: the lozenges-pattern façade, portico and the crenellations that seem to repeat infinitely in their multiplicity. The designer is a mysterious figure, and if he corresponds, as hypothesized, to a single individual we could speak of a character aware of the architecture of his time, near and far, with remarkable geometric and conceptual abilities in design, including an expertise in building construction. The possible symbolic references to the geopolitical context of the time are manifold. The process of absorption of eastern elements in medieval Venice was already largely dependent on trade, commerce and on the relocation of relics of martyrs and saints. Such sum of eastern references had shaped the image of Venice as a great eastern emporium and a holy city. The reconstruction of Doge’s Palace in the 14th century made it necessary to symbolically recall the commercial routes to celebrate the merchantile power of Venice in the East and the figure of the merchant as a new elite, in an emulation of the architecture of power and magnificence of the Mamluk Sultans. From the beginning of the 14th century, Venice was organizing trips to the East on a regular basis, in a dense network of exchange with Mamluk, Egypt. Reproducing Islamic architectural elements at home, along with references from Middle Eastern governmental buildings, could reflect a will to showcase Venice’s power, both from a commercial and political viewpoint. Thus, the new 14th century Doge’s Palace had to emerge as a symbol of commercial affiliation and representation of the mercantile elite’s political hegemony, which was already rooted in trade with Egypt since 1291. Another opportunity that the reconstruction of Doge’s Palace offered was the celebration of an important victory against the papacy-imposed embargo. Venice had a difficult relationship with the pope; the Serenissima was crushed between its own reality and a Christian legacy opposed to trade with Islamic territories. The concept of “architectural orientalism” that applied in Venice can help us understand such a dilemma. 19th century Orientalism was based on a fascination of and exchange with the East, but also on colonialism, on ideological Eurocentric positioning and on an imperialist predisposition. The concept of “architectural orientalism” that applied in Venice can help us understand such a dilemma. 19th century Orientalism was based on a fascination of and exchange with the East, but also on colonialism, on ideological Eurocentric positioning and on an imperialist predisposition. This can also be applied earlier to architecture in Venice, albeit mitigated by a Venetian mentality less Eurocentric and more open to the East at the dawn of the 14th century during a historical period in which the concept of Europe was not yet as defined as the contrast would become between the Christian West and the Islamic East culminating at the Crusades. But how could medieval Venice perceive itself as a “European” or “Western” state opposed to “the others” of an East that was still a vague concept, lacking any distinction between Middle and Far East? Such a dilemma came to light in the political and commercial life of the Serenissima. The papacy strongly opposed trade between a Christian state like Venice and the Islamic world, which fueled contradictions and paradoxes in the relationship through continuous self-justification for the trade partnership. In 1320 the papacy imposed an embargo of any kind of commercial exchange with an Islamic institution. The Venetian economy was severely affected while Venice’s paradoxical perception of itself and its relationship with the Islamic world was enhanced in that the city was heavily dependent on trade and diplomatic contact with the Middle East, yet it remained proud of its Christian legacy. In 1344, after more than 20 years of tribulation, Venice finally persuaded the pope to grant permission to send a limited fleet of ships to Egypt in exchange for special concessions to the papacy. 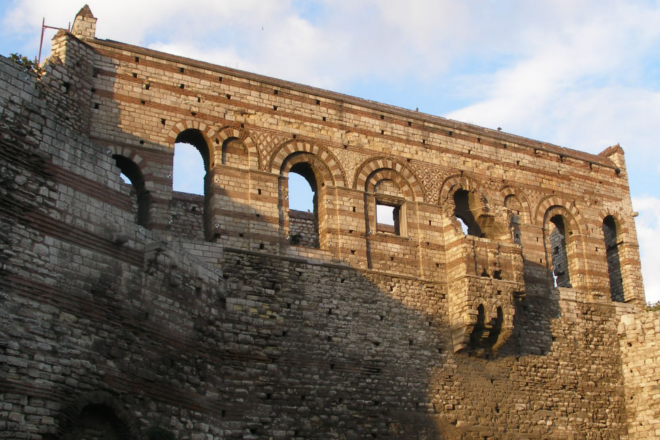 The Venetians visited the Mamluk Sultan and succeeded in restoring the privileged exchanges. As we know, it is precisely at this time that the project for the new Doge’s Palace was conceived with its Islamic allusions that would have wanted to convey this important political victory to those who were aware of the controversy with the papacy and were able to grasp the symbolic meaning of an Islamic architectural tradition rooted in Venice. Drawing of the exterior of the Great Iwan, Saladin Citadel, 1333-34. Illustration by R. Hay, Illustrations of Cairo, 1840, pl.19. 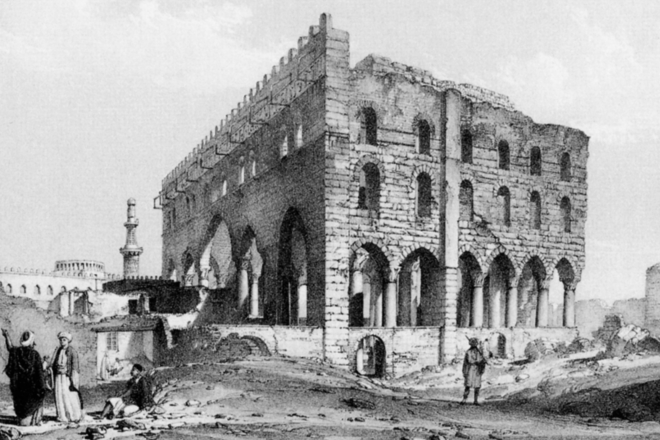 Tekfur Sarayı, or Palace of the Porphyrogenitus. Istanbul, late 13th / early 14th centuries. In the concrete, the Islamic elements found in the St. Mark’s area can be explained through themes involving multiplicity, repetition and infinity, traditionally used in Islamic architecture to decorate in abstract composition lacking any portrayal of the human figure. Venetian and Islamic architecture shared a concept of space conceived as two-dimensional and fluid. 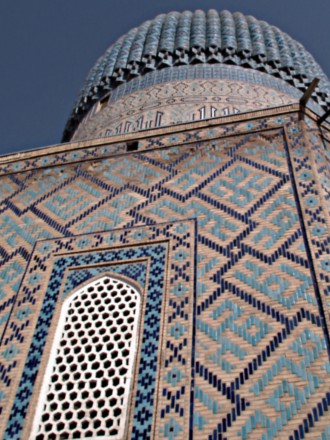 Some currents of thought state that the two-toned lozenge motif of such façades originates from even further East, from the palaces of Ilkhan and Mongolian architecture and from direct Seljuq influence in northern Iran. This influence could be easily grounded in new Venetian trading routes along the Silk Road during the papal embargo. 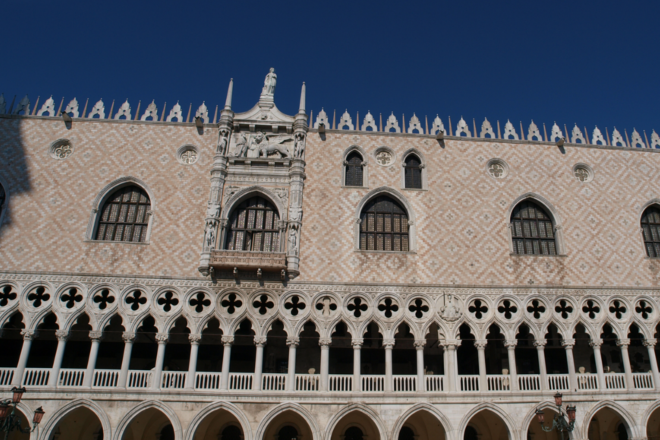 Further allusions to Islam are found in the internal courtyard of Doge’s Palace, built around a large cistern and well-curb accessible to the public, which recall the courtyard of a mosque and its fountain for ablutions. The Palace, along with its crenellations and its view of the Basilica’s domes, evoke the great religious complexes of the Sultans. The allusion to Mamluk architecture in the color, size and delicacy of the crenellations would have been obvious to anyone familiar with the Egypt of that period. Although it is possible to narrow down the chronological and geographic influences of the Islamic world on Venice to Fatimid and Mamluk, Egypt, usually explained by Venice’s commercial routes to Egyptian harbors, more justification for the Islamic influence on architecture in Venice requires further research. Architectural elements were on loan, imports from Egypt thanks to the presence of artists able to reproduce them once back home. Doge’s Palace, 1400. Façade on St. Mark’s Square. If we think about the crenellations of Doge’s Palace, which immediately recall those of Egyptian mosques, there seems to be a missing link between the 14th century Mamluk crenellations and those of the Ducal building, a blank space in an evolutionary tale. Further complicating matters is the difficulty of separating Byzantine elements from Islamic ones, since it is very likely that Byzantine architecture of the 11th and 12th centuries was influenced by Islamic architecture, transmitted to Venice only after being filtered through Constantinople. Regardless of such origins of influence, what is certain is that the skill and fantasy of the mysterious personality who reconstructed Doge’s Palace in the 14th century contributed to the construction of a unique Islamic-style building in the world and to a special Venetian fusion of architecture that melts various different global influences and architectures unique to Venice alone.